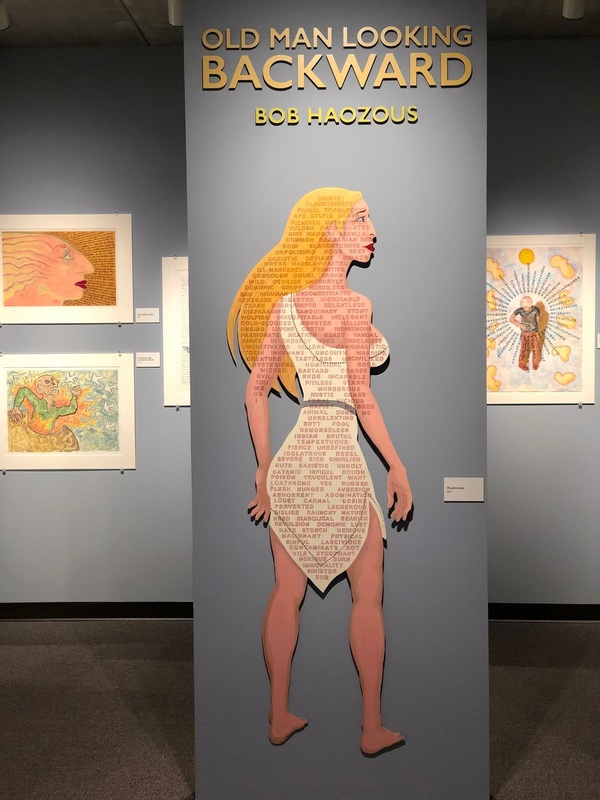 An exhibition currently at the Wheelwright Museum of the American Indian titled “Old Man Looking Backward” is devoted to Bob Hazous (b. 1943). Son of the sculptor, Allan Houser (!914-1994). Haozous was born in Los Angeles, but spent much time in Apache, Oklahoma where his father’s Chiricahua Apache tribe was headquartered. His parents taught at the Intermountain Indian School in Logan, Utah and Haozous studied at Utah State University and before enlisting in the U.S. Navy during the Vietnam War. After four years serving on board the USS Frank Knox, he attended the California College of Arts and Crafts in Oakland and earned a BFA in sculpture. Although he is best known for his large outdoor sculpture (see his 1991 piece “Border Crossing”) he is also known for his jewelry, drawing, painting and print making. His sculpture too, ranges through various media including steel, stone, aluminum and wood. In fact, a couple of years ago we were on our way to Taos for my wife’s shoulder surgery when we stopped at the Rancho de Taos (a church made famous through photography, particularly an image by Ansel Adams). 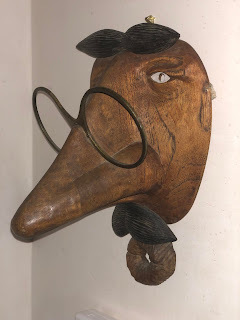 There we found a small antiques shop where we saw what reminded us of an Italian Comedia del Arte mask in wood signed by Hazous. After acquiring it, we decided to get in touch with the artist we had already admired to find out more about our piece. I believe quoting part of his response might help to understand the artist. “I created the mask sometime in the late 1980’s. I carve wood when the weather is restricting my outdoors work time. Sometimes the challenge of working in wood and creating something ‘different’ drives my imagination. I clearly remember making the mask, probably looked at as a humorous piece by some, but to me it represented an aesthetic and compositional challenge, probably inspired by the eyeglass frame.” The latter was part of the “junk” he acquires for possible future use. In the film he is fashioning brass knuckles and if he made a fist and hit you with them you would have dollar sign marks embedded in your skin. He says it is only partly a joke because he has a point to make. The space where the video is shown is dominated by his large sculpture called, “Good Indian”, 2018, clearly done for the show. It is a huge mouse trap with its a spread of one-dollar bills on the base and the words Good and Indian encircling the word “Trap”. Before I went back to the museum to check the title, I would have written that the title was “Good Indian Trap” because that is precisely what the artist means. Money may be a trap for Indian artists, but I would venture it is no different for Anglos. They/we get caught keeping score by how much we make. Coincidently, I just read a quote by the country singer Johnny Cash, “Success is having to worry about every damn thing in the world except money.” How true is that?! Every time I went back to see the exhibition, I became more aware of how angry the artist is. It is not so much in the images themselves as in the verbiage within the images. In Haozous’ depictions of himself, and there are several in the show, there are no words, just images of melancholy. 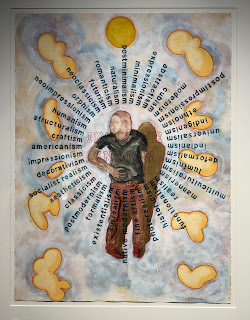 In the signature work, “Old Man Looking Backward”, I would guess that the planes and puffs of smoke above are reminiscences of his experiences on the destroyer during the Vietnam War watching the planes above and the bombs being dropped. One might think the artist is recalling beautiful women of his youth in the striking blonde “Pocahontas”, which is literally front and center in the exhibition, but then you start to focus on the angry worlds on the piece.. The fact that it was created in 2017 makes one think of the Trump era and his hateful dubbing of Senator Elizabeth Warren as Pocahontas. In this image titled “Invisible Indian”, which is both humorous and significant, I believe that Haozous is commenting not only on how many different art movements have come and gone during his life time, he is also making fun of how we try to pigeonhole artists into categories. He believes that the artist, and particularly the Native American artist, should be delivering a more important message as to their histories and struggles. We might as well end with a boom … actually “Boom” 2016, is the title of the image of another voluptuous woman, probably intended to grab our attention, so that we notice the words in the piece that vividly describe the horrors of the Vietnam war. Not everything we look back on is happily nostalgic, sometimes it is just tragic.